You will no longer be able to sync with this machine because you’ve upgraded to iCloud. 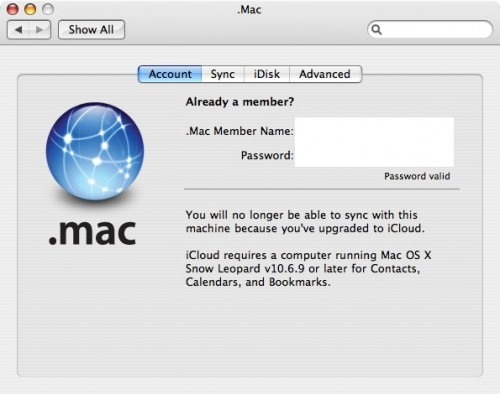 iCloud requires a computer running Mac OS X Snow Leopard v10.6.9 or later for Contacts, Calendars and Bookmarks. This is actually the first mention of more detailed iCloud system requirements beyond a brief description on Apple’s iCloud page. OS X 10.6.9, of course, has yet to be released, but it’s nice seeing that Apple won’t be leaving out Snow Leopard users with its upcoming cloud service.